The Holy Family in Barcelona. The Holy Family is the most famous and characteristic monument of Barcelona. As a prime example of modernist architecture designed by Gaudi, thousands of tourists flock each day to contemplate the curious though unfinished temple. Construction began in 1882 with Gothic style. 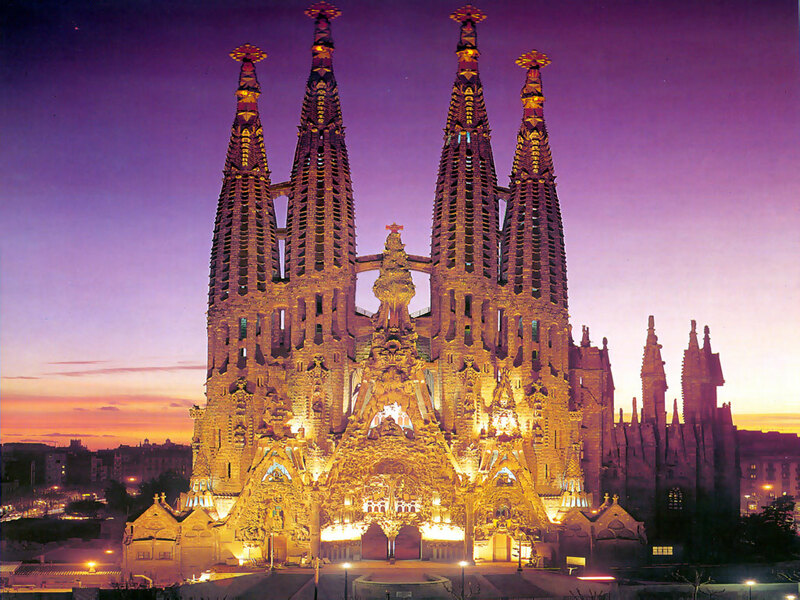 A year after the project was put in the hands of Gaudí, who completely redesigned. Gaudí designed a unique and innovative temple was to be composed of 18 towers, but finally just had time to create one before his death. Gaudi died in 1926, leaving unfinished the project that occupied the last years of his life but, thanks to the drawings still, his dream comes true gradually through the work of other artists and the money raised from donations and visits. So far they have been erected 8 of the 18 towers designed by Gaudí. The architect decided that twelve of them were dedicated to the Apostles, four Evangelists, one for Mary and one for Jesus. Each will be equipped with different heights depending on the religious hierarchy they represent. You can access up to the top of some of the towers to see the city from above and see some details of the exterior of the temple a short distance. -Facade of Birth: Dedicated to the birth of Christ, it is a richly decorated facade and full of life. -Facade of the Passion: Something more austere and streamlined than the other facades, intended to reflect the suffering of Jesus during the Crucifixion. -Facade of Glory: The main facade, monumental much larger than the rest, represent death, the Judgment, the glory and hell. Aware that he would not have time to build it, Gaudí left made the sketches for his successors could finish the job. To design the interior, Gaudí was inspired by the forms of nature, creating columns shaped tree trunk inside the temple converted into a huge forest of stone. The latest forecasts estimate that it could actually finish in about 30 years, that is, before the conclusion of the second centenary of the birth of the great architect. To get to know the Holy Family nothing better to hire our guided tour. For just 12 € you will enjoy an hour and half drive from his hand a love guide Barcelona and its most iconic building. In addition, you will save yourself the endless queues. « Multnomah Falls in Oregon.